I'm definitely a big fan of everything that Rick has done. I've read most of his projects over the years. I really love The One, I love Brat Pack, I loved his run on Swamp Thing. Rare Bit Fiends, especially the first 15 issues or so, every page is just a chance for him to really stretch his illustrations and his page layouts to recreate the sense of these dreams he's had and all the characters, machinery and landscapes that he encounters in them. I love that stuff. And I love that he's so workman-like about it. He's not trying to give it a fancy polished finish. But he's completely adept at drawing anything you could possibly imagine, from any angle, completely convincingly and putting you right there. That level of illustration has nothing to do with cartooning but is just an incredibly high level of pure comic book illustration ability. In my own work I really aspire to be a Rick Veitch-type of creator where he's always coming up with interesting ideas to write about and he's always reliably at a high level of competence in the illustration. That first run, where he's really giving it his all, he gets a chance to really show his comic book chops in a way that a normal story doesn't quite allow because he's doing these dreamscapes. But all of his normal comic books are incredibly imaginative in the way that he's telling the story also. The page layouts in something like Maximortal, nobody does better page layouts than Rick Veitch. He puts so much creativity into the way the story is unfolding as a page composition. Rare Bit Fiends is a great example of all of that. And it's very entertaining because he's always dreaming about hanging out with Alan Moore and Robert Crumb and Bob Dylan and Steve Bissette and Dave Sim. It's a look inside the subconscious of somebody who's obsessed with comic books, and these characters keep walking through and insinuating themselves into his dream circumstances in really funny ways. Also, it's just such an underdog series. I don't know anybody that reads that stuff. I'm always trying to tell people that they should check it out. I couldn't find the original issues at comic stores when they were coming out. My local comics stores weren't even carrying them. 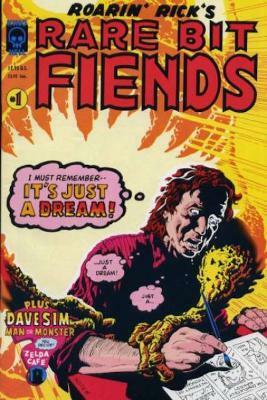 Similar to what happened with Alan Moore's Big Numbers, Rare Bit Fiends was a series that was not alternative enough for the alternative comics market and not mainstream enough for the mainstream market, it was that third path in the '90s that people like Alan Moore and Rick Veitch tried to create. But it was a financial failure so it just remains this little lost era.